Another day, another city, another cover. 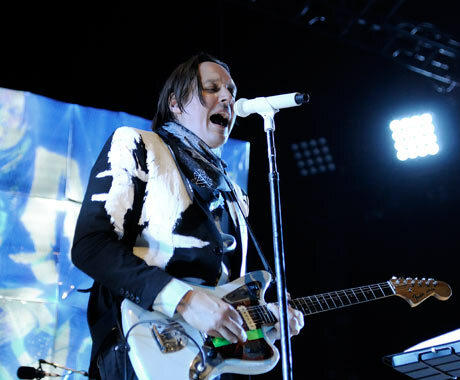 Last night (August 19), Arcade Fire rolled through Mansfield, MA, and continuing their trend of covering an artist from each city they play in, the stadium indie rock outfit treated fans to a Pixies classic. Originally appearing on 1991's Trompe le Monde, "Alec Eiffel" got the cover treatment by the bobblehead-sporting band in honour of the Pixies' neighbouring hometown of Boston. Other recent covers from Arcade Fire include a Seattle tribute to Nirvana with "Smells Like Teen Spirit" and a shout out to Fugazi with a rendition of "Waiting Room" in Washington, DC, earlier this week. Check out the Montreal-based band's remaining tour dates here and watch a live video of "Alec Eiffel" below.